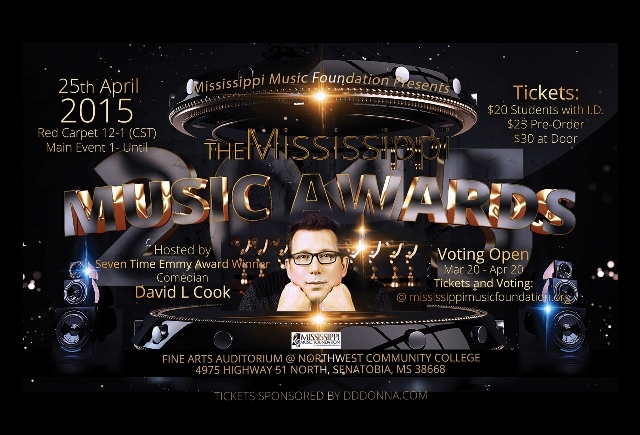 April 25th 2015 - Mississippi Music Awards — Mississippi Music Foundation, Inc.
Fine Arts Auditorium at Northwest Community College 4975 Hwy 51 North, Senatobia, MS, 38668 Saturday, Apr 25, 2015 from 1-6 p.m (CT)The Mississippi Music Foundation Proudly presents the Mississippi Music Awards. Mississippi’s best singers and songwriters, from folk to country to alternative American Roots. Voting for individual categories will take place from March 20, 2015 to April 20, 2015. Awards for in house categories will be awarded at the culmination of the event.